An explosion of creativity in our workshop! 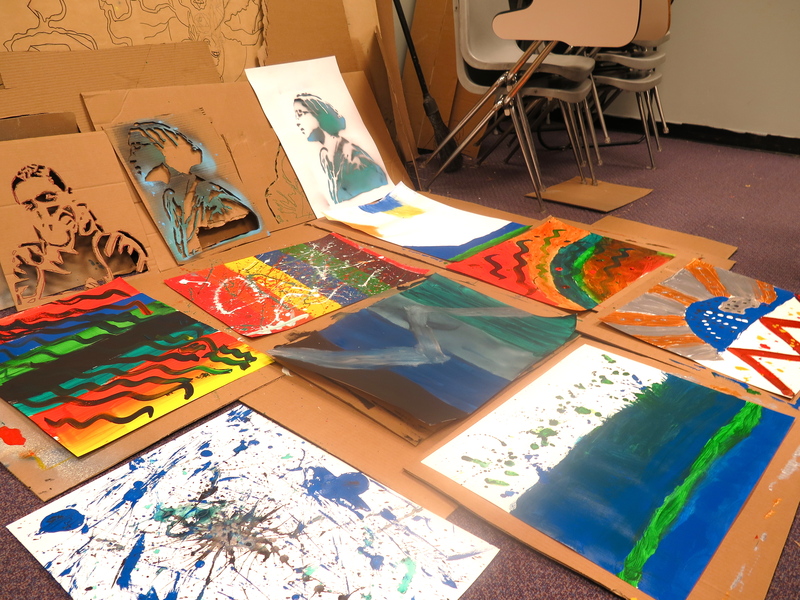 This year, I have been leading arts-based workshops with youth involved in the justice system. 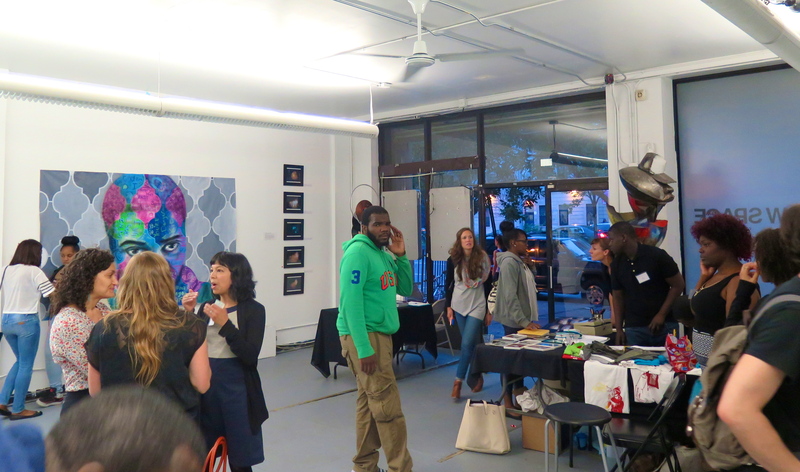 Through the organization Artistic Noise, I worked with teens in Brooklyn and Harlem who have recently been in trouble with the law, engaging them in creative activities and the life experience of creating art to be exhibited publicly. Together we had discussions and presentations, went on field trips, made stencils and collages, explored abstract expressionism, painted a mural, made custom T-shirts and learned painting and aerosol techniques. 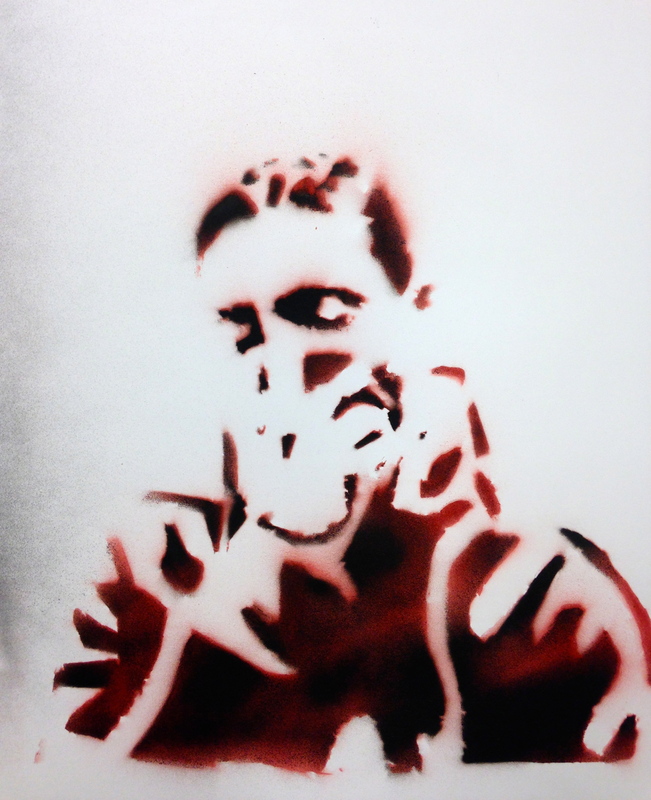 For one project in Brooklyn, the students created self portraits on canvas in which they spray painted their stencils over their own abstract backgrounds. In a second project, we had discussions about what positive achievement each of them would like to one day be known for. This was a question many had not previously considered, assuming that they could only be in the media for negative actions. They glued newspaper collages onto canvas, spray painted their own images on top and then created headlines that they dreamed they would one day see: achievements in the fields of medicine, sports, science and entertainment. 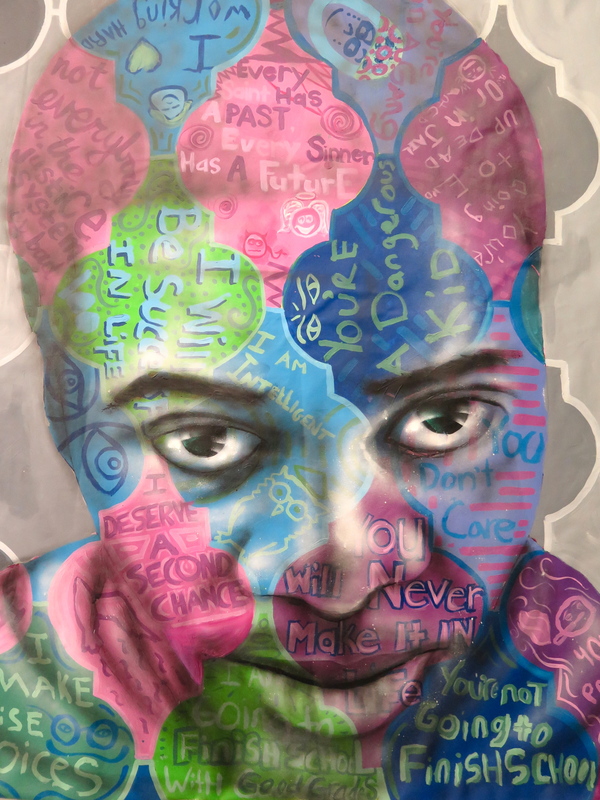 In one workshop in Harlem, the participants came up with a concept for a collaborative mural: the face of a young man would be full of thoughts, with one side featuring people’s negative judgements of them that they struggle against, and the other side including positive statements of self-affirmation that they wished others could know about them. We discussed the racism and stereotypes that these youth face on a daily basis, which they said leads them to feel that society views them as being criminals, drug addicts, uneducated, lazy and uncaring. They expressed that they wanted people to know who they truly are; young men and women with a strong desire to be positive members of their communities and succeed in their educational and career pursuits. We spent weeks working on the mural together, putting all these ideas into it. 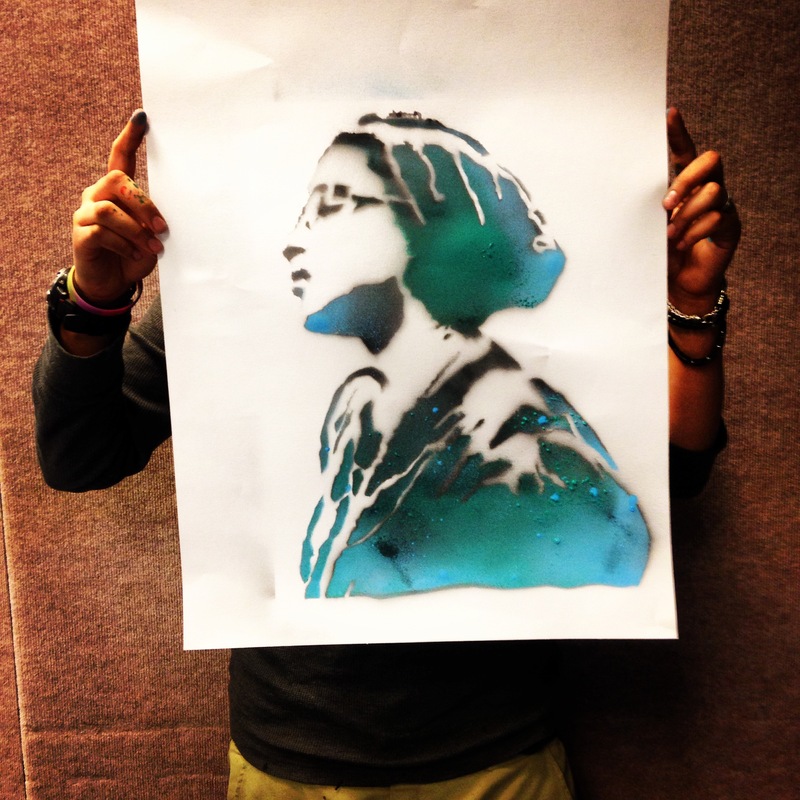 A stencil piece by the student who is now facing a murder charge. Of course, things didn’t always go smoothly, as there are challenges working with this population. The worst moment came when one participant, who had been doing quite well and was seemingly headed in a positive direction, was arrested for murder. He was well- liked by the group, who were understandably upset by the news. He is still in Rikers awaiting trial. However, the rewards of this work far outweigh the difficulties, as I believe it is this population that most needs positive adults in their lives and creative activities to direct their energies toward. I enjoyed working in partnership with two licensed art therapists, who made sure that each workshop included therapeutic elements. It is amazing to see kids open up about their lives while making art in a way that they may not have been comfortable doing in a traditional therapist’s office. One 17-year old boy disclosed that he was stressed because he his girlfriend was pregnant, exactly the situation I had found myself in at his age. I was glad to be able to share my story with him and let him know that while being a parent is especially challenging at that age, it can also be an amazing experience and one that does not need to disrupt one’s life dreams. After four months, we headed to the annual Artistic Noise exhibition in Harlem, in which works of art by dozens of court-involved young people were displayed for the public to experience. My participants were blown away; there on the walls were their creative expressions, exhibited professionally with a crowd of people from all walks of life admiring them! Many of the pieces were sold, to the delight of the young artists. What an experience for a teenager to have! Even better, some of the organization’s most dedicated participants had paid jobs in which they curated the show and created artwork, learning many skills along the way. I am currently planning future arts-based projects with youth and adults in the court system, including those who are currently incarcerated, as I believe our justice system is broken and fundamentally unjust. Through the arts and advocacy, these issues must be brought to the light and humanized in order for us to have a long-overdue societal dialogue.